Become the best marketer you can be. Improve yourself: As part of our network and platform for advanced online marketing. Get up-to-date insights, strategies and tactics to increase your (or your client's) sales, leads and visibility. Weekly videos to advance your marketing skills. $0.01 Facebook clicks? High-converting landing pages? Easy, powerful links? We bring you brand new video lessons with tons of insights that will enhance your marketing skills and knowledge in many fields. Vote on topics that interest you, and we will invite select speakers for our videos to improve your skills and deliver the most value for you. Access our video library 24/7 on smartphone, tablet and desktop. From anywhere in the world. Get unlimited access to our recordings. All past talks and presentations. Watch recordings of all our previous talks and presentations online. New videos added every week. Once a week, we add a new high-quality video to our library. You'll never miss an insight. Our videos are in English. You can display subtitles in English and German. We aim for your best learning experience. Enjoy ultra sharp videos in Full-HD with crystal clear sound, recorded on professional studio microphones. Pre-written text files with key takeaways. No need to take notes – we do the job for you and provide an editable text file with each video. Subtitles in your preferred language. Starting with English and German. Prefer reading? Get the full talk as text and images. Get expert feedback. Help others. Make connections. 24/7 Q&A chat for our PRO members. Get valuable answers to your questions and share your advice with other PRO members. Meet our amazing members, see and post job offers and find partners for your projects. 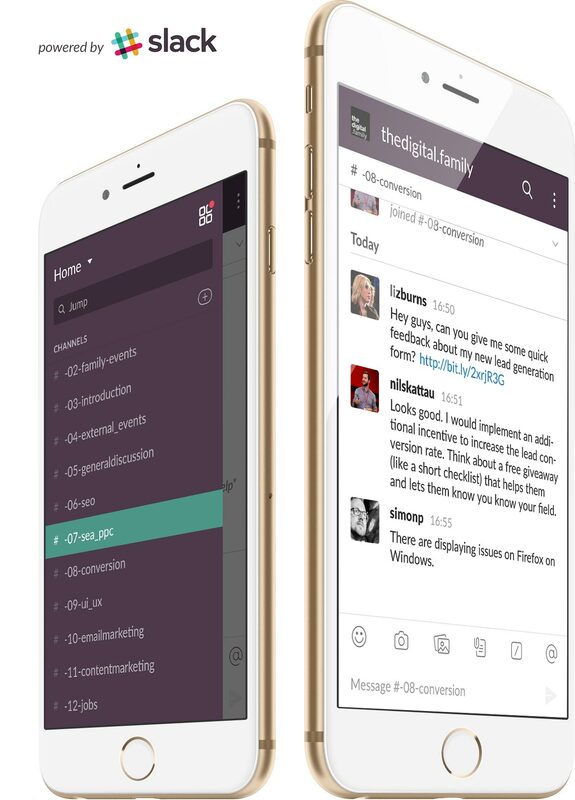 Easily access our chat via Slack app on iOS, Android, Mac and PC. SEO / SEA & PPC / Conversion / Growth Marketing / UI & UX / Social Media / Content Marketing / E-Mail Marketing and more! All of our PRO members have gone through an application process and are proven experts in at least one marketing field. “Today's marketers need to keep track and have a top-notch understanding of many different disciplines. A comprehensive, up-to-date overview and deep insights. Watch all talks of OMLIVE 2018. One single day that will really take your marketing skills to the next level. And give you a competitive edge in the most relevant online marketing disciplines. We bring some of the best marketers in Europe and the world to your screen. Watch from wherever you are and ask your questions to our speakers. To attend and get the talk recordings, simply request your invite to the digital family on this page for free. Launch Special: Watch all OMLIVE talks online – for free.